… The 2-1 win over Manchester City at the Allianz Arena bestowed another, altogether tinier treble of three friendly titles on the team and their new manager, Pep Guardiola, but the 42-year-old was on the defensive in the subsequent TV interview with the local broadcaster. Are you – despite the team’s problems – optimistic for the new season, asked the reporter. “Of course, the manager has to be optimistic,” Guardiola said, smiling in the kind of grey checked shirt that’s ubiquitous in Brooklyn hipster dives, much less so on Bundesliga coaching benches. Soon after, the interview was cut short. 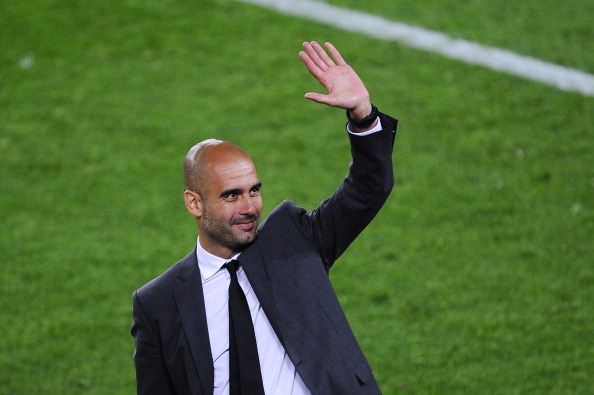 Guardiola was speaking well in German and cutting a very genial figure, but he was not nearly saying enough. His totally nuance-free sentences were too crude, maybe willfully so, to provide any meaningful insight into his thoughts about tactics and personnel. More importantly, Guardiola’s obsessive attention to detail in training – “I’ve never had a manager who changed so many things,” said striker Claudio Pizarro, 34 – and experimental lineups that have verged on the capricious, with right-back Philipp Lahm being drafted into central midfield and target man Mario Mandzukic toiling fruitlessly on either wing, have only succeeded in upsetting the ultra-smooth running of last year’s win machine. “Pep Guardiola turns the most successful team in the history of Bayern Munich on its head,” read a dispatch by Der Spiegelfrom the Bayern training camp in Italy. But even relatively subtle tweaks, such as his preference for one holding midfielder instead of two and his toying with the strikerless formation that worked so devastatingly well for his Barça can have wide-reaching consequences in a squad as finely tuned as Bayern’s. The former Reds coach Ottmar Hitzfeld once said that Bayern were “a sensitive construct, like a Ferrari motor – every small thing has to be correct”. Last season, Guardiola’s predecessor, Jupp Heynckes, had mastered the art of keeping everyone in line. But the 68-year-old’s case was greatly helped by the team’s utter devotion and focus on improving on the three painful runners-up places in 2011-12. As treble winners, the patience of those left behind for Pep could now be wearing thin more quickly, especially in light of the arrival of two more big names in Mario Götze, bought for €37m from Borussia Dortmund, and Thiago, who is in danger of being seen as the teacher’s pet. Signing Spain’s Under-21 captain has put immediate pressure on the established midfield duo of Bastian Schweinsteiger and Javier Martínez. The latter will have to get used to life as a centre-back, while the former, a key figure and fans’ favourite, has featured intermittently in the starting lineups. The 29-year-old has only just returned to fitness after an ankle injury but Thiago’s outings as the sole holding midfielder in many games was seen as ominous for his chances. “I’m not quite sure [of his plans for me],” admitted Schweinsteiger. The sporting director, Matthias Sammer, was forced to intervene on his behalf. “Anyone who questions Bastian Schweinsteiger is lacking respect,” said the 45-year-old. Mandzukic, the scorer of Bayern’s opener in the 2-1 Champions League win over Dortmund at Wembley, has had an even more difficult time. The Croat scored two goals in two games at the Audi Cup but cast angry glances at Guardiola, who had left him out of the starting lineup on both occasions. The chairman of the executive board, Karl-Heinz Rummenigge, feels that this kind of reaction is to be expected. “You won’t find a Bayern player who’s happy to be on the bench,” he said. But he, too, knows that Pep could probably do a better job explaining his decisions to his charges. Twelve out of 13 friendlies were comfortably won. The one exception has somewhat blighted the whole pre-season, however. A 4-2 defeat by Dortmund in the hotly contested German Supercup brought fears that Guardiola’s fervour for free-flowing football will come at the cost of defensive stability – and with it, unwanted comparisons with the former Bayern coach Louis van Gaal. The Dutchman, Guardiola’s mentor at Barça, reigned for one-and-a half seasons that were marked by an unsustainable cavalier approach. The second half against Dortmund echoed those dark days, as Bayern lost their shape completely in midfield. “I noticed that everyone seemed to be occupying a different position,” said Thomas Müller, wryly. A much more composed performance against City – and Guardiola choosing a comparatively orthodox team that looked suspiciously like his best XI, with Schweinsteiger back installed in his favourite role ahead of the back-four – went some way to allaying the worst doubts before the season’s first competitive games, on Monday, away to fourth-tier BSV Rehden in the DFB Cup, and on Friday at home to Borussia Mönchengladbach in the Bundesliga opener. “We know it’ll take time,” said the captain, Lahm, Guardiola’s staunchest ally over the past few weeks. But Arjen Robben hinted that some players are yet to be convinced that the changes will improve a team that has just had an unimprovable season. “You don’t have to make football more complicated than it really is,” said the Dutchman, quite suggestively.